Petr Brandejs (Nový Jičín, CZ) has completed Europe's first Wernick Method class. It was held at a local restaurant - and, as you can see in the photo, the students took full advantage of that! Petr is in the front row, second from left, holding the guitar. 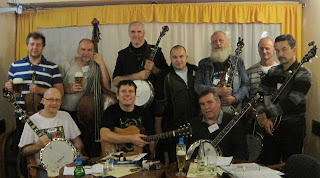 Petr's report: 'The first European Jam Class using the Wernick Method was held in Nový Jičín, 350 kilometres (about 200 miles) from Prague, Czech Republic. It went for five consecutive Sunday evenings, ending on 18 November. The nine students, traveling up to 100 kilometers (62 miles), were mostly banjo players so I played the guitar most of the time. On 22-24 March 2013 Pete & Joan Wernick will themselves be presenting a Jam Camp in Prague, CZ, a week after they take part in the 5th European Bluegrass Summit in the same city. See the Dr Banjo online calendar for more details.